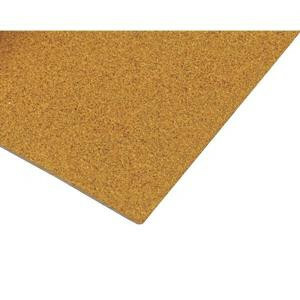 QEP Natural Cork Underlayment is ideal for reducing sound transmission from upper levels to lower level living spaces. Under ceramic tile, on a 6 in. slab with a suspended ceiling in the floor below the acoustical ratings for the 1/2 in. cork are STC 89 and IIC 88. These ratings are outstanding since architects typically require minimum ratings in the 50РІР‚в„ўs. Natural Cork Underlayment can be used under ceramic tile, porcelain tile, stone, marble, engineered hardwood and laminate floors. Natural Cork Underlayment also acts as a crack isolation membrane that resists the transfer of cracks from the subfloor into cracked tiles on the finished floors. Natural Cork Underlayment also reduces thermal transmission, increasing the effectiveness of floor heating systems. Install like a professional by using Roberts 7250 Cork Adhesive.